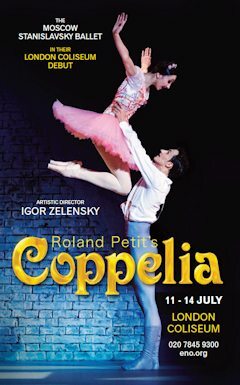 The Moscow Stanislavsky Ballet brings Roland Petit’s 1975 version of one of the world’s most well-known and charming ballets, Coppélia, to the London Coliseum for the first time this July, with music from the English National Ballet Orchestra. The story follows the comic adventures of the red-blooded Franz and how he falls in love with a beautiful, life-like doll. The doll – Coppélia – is created by the eccentric yet mysterious toymaker Dr Coppelius. The funny plot thickens when Franz’s jealous lover, Swanhilda, takes her friends on an adventure into the spooky toyshop of the mad toymaker to confront her rival. Of course, the story ends happily after the truth is uncovered. The whole town joins the most fabulous wedding celebration for the besotted Franz and Swanhilda. The vibrant musical score was composed especially for the ballet, in 1870, by the great master Leo Delibes. It features well-loved classics such as the stirring Act I Mazurka and the grand Waltz of the Hours. The Moscow Stanislavsky Ballet company was formed in 1929 by former Bolshoi ballet star Victoria Krieger and quickly established itself as one of Russia’s leading Ballet companies touring extensively across Europe and the USA. The company brings together the finest principal dancers including Sergei Polunin, Semyon Velichko, Kristina Shapran and Erika Mikirticheva. It is led by the General Director Vladimir Urin and internationally renowned dancer Igor Zelensky is Artistic Director.